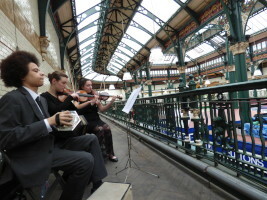 After much preparation and excitement, our first event as part of the national Museums At Night festival took place last night at Leeds Kirkgate Market. It was great for us to return to the birthplace of the business and to see our brilliant performers from the University of Leeds bring our history to life. 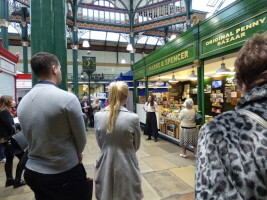 Attendees had the chance to watch performances from M&S founder Michael Marks, Esther Brown one of the first M&S shopgirls, Michael’s son Simon, who transformed his father's penny bazaar business into one of Britain's best loved retailers, and Flora Solomon, a Russian heiress who revolutionised M&S staff welfare. 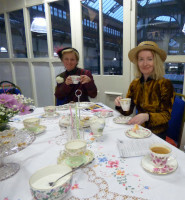 Between performances our fantastic musicians played from traditional Edwardian music from our archive collection and colleagues from the M&S Trinity store in Leeds served tea and cake in our pop up vintage tea room courtesy of the brilliant Rose Pink Vintage. We were delighted with the success of the event, there was a brilliant atmosphere and we like to thank everyone that attended, and especially those who donated to M&S Trinity’s local charity, Archway. Finally we would like to say a particularly huge thank you to our actors and musicians, the M&S Trinity store, Rose Pink Vintage, our brilliant volunteers and of course Leeds Kirkgate Market! See some of the great coverage of the event here and keep your eye out for the event film coming soon!